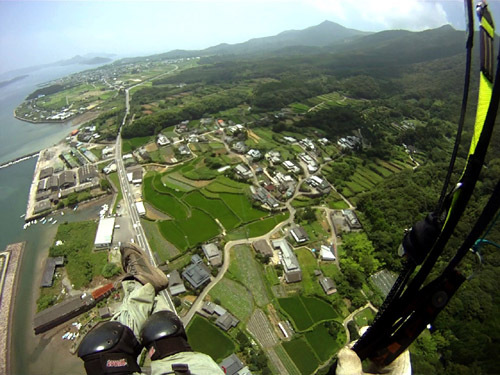 On July 18th and 19th many paragliders from all over Kyushu gathered in Kuratake to enjoy a weekend of flying and relaxing. A 'top landing' or 'toppuran' as Japanese fliers call it, involves landing at a place you normally take off from, that is, typically at the top of the mountain. On days with sufficient lift to sustain indefinite ridge soaring, this is a convenient way to return to where one started, obviating the use of other transportation (or one's legs) to regain the top of the mountain. Needless to say, however, a top landing is comparatively difficult to pull off, typically involving touching down at small, sloping, windy areas with dangerous rotors lurking just downwind of the ridge top. since the paraglider has no motor, careful management of altitude via using one's speed and position within the lift zone is required in addition to precise horizontal manouvering in a varying crosswind. Normally, this maneuver is taught to folks with more experience, but my teacher decided to give it a shot with me after maybe getting bored of flying his radio controlled model glider next to my canopy. in the beginning, you see me moving away from the mountain in an effort to leave the lift band and reduce altitude. when i felt it was just right, i turned back in and more or less by luck, found the right line! a little while later, i also managed a 'touch-and-go' landing, taking off immediately after landing without letting the glider fall down, but by that time the battery in my helmet-mounted camera had given out. still, i think this is a pretty fun clip. 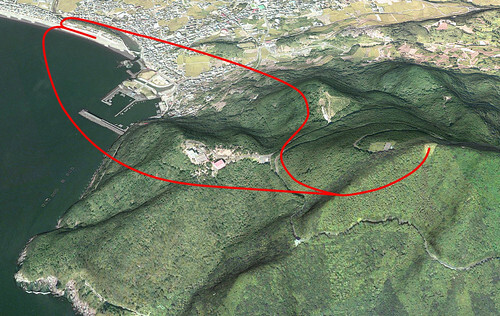 Here is some information about Saruba-yama, a great established flying area located in Nagasaki Prefecture about 35km directly north of Hondo, where we live...which sounds close, but one needs to ride a ferry to get there. Anyway, it is a beautiful place on the coast where one can enjoy great ridge soaring and a unique flight above the sea before landing on the beach in Chijiwa town. These pictures show the default glide routes from Mt. Saruba. 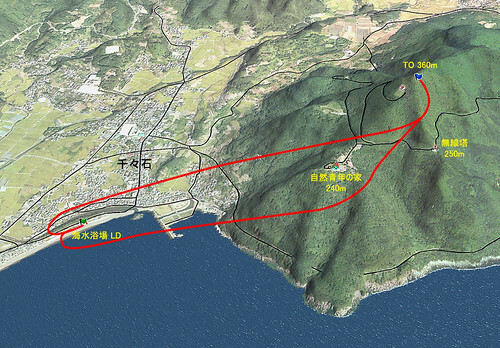 There are two variations; the pilot needs to choose a suitable route depending on particular circumstances. Note that the landing is generally downwind of the takeoff, as this area is used primarily during the summer season when southerly winds prevail. (South is to the right in the first picture, and more or less downward in the second.) The landing area is not visible initially so careful navigation is required along the way. The decision which route to take needs to be made based on available altitude and also wind, because attention must be paid to the rotors and sinks in the lee of the mountain. 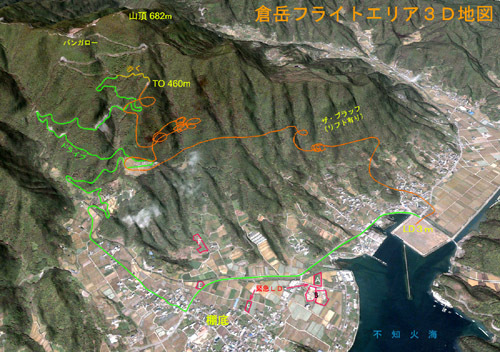 The routes shown are generally safe for winds between south and west; note how the inland route avoids the east (left) facing lee slope of the ridge on the north side of the mountain and how the outside route stays altogether clear of the mountain's lee side. The outside route is longer but often offers a better glide ratio over the sea in following wind and away from the lee downdrafts. Finally, here is a video we shot during our first visit to Saruba a few weeks ago, under more or less calm conditions.